This project creates a TMS6100 speech PHROM (PHrase Read Only Memory) for use with the TMS5220 Voice Synthesis Processor in an Acorn BBC Microcomputer. Whilst it’s still possible to purchase TMS5220 ICs from sites like Ebay, the TMS6100 was a mask-programmed ROM that Acorn produced specifically for their speech upgrade and is therefore difficult and expensive to source. 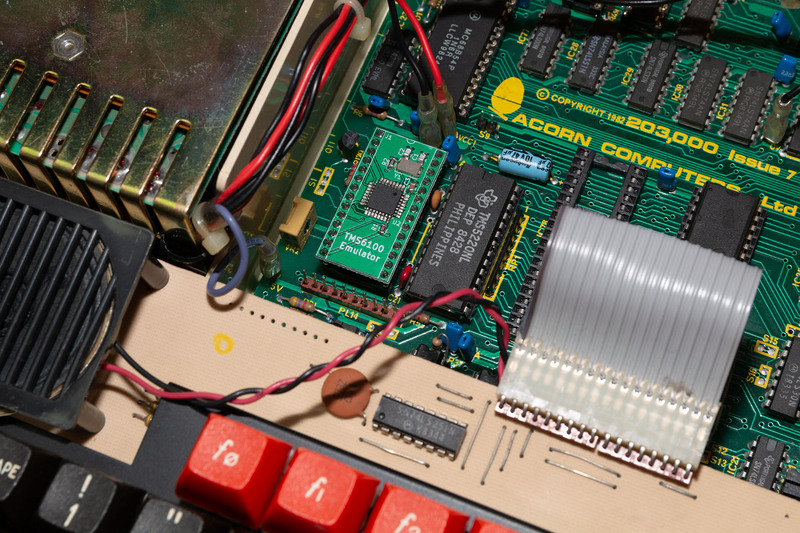 Instead of using the original ROM, this project uses an ATmega32U2 microcontroller to both emulate the ROM and provide the original Acorn voice sample data recorded by BBC newsreader Kenneth Kendall. The design fits in the BBC micro’s PHROM socket and required no modifications to the BBC Micro in order to work. The board consists of only 7 components; 3 capacitors, a crystal, 2 resistors and the microcontroller. The TMS6100 is an unusual ROM in that it provides a parallel address bus along with a serial data transfer (the original ROM was also capable of 4-bit parallel data transfer, however this is not used by the TMS5220 processor). 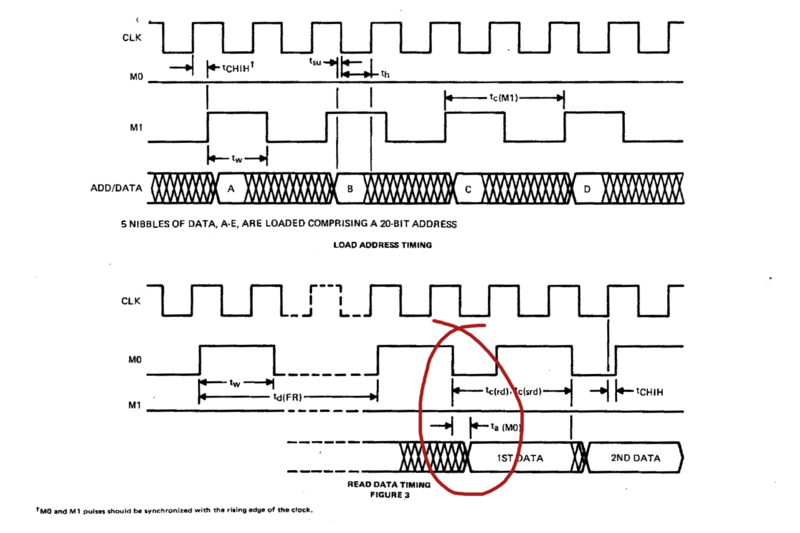 As can be seen in the schematic, there are 4 ‘ADDx’ pins that act as the address bus. ADD8 also doubles as the MISO (Master In Slave Out) SPI pin. In addition, there are two ‘command’ pins M0 and M1 that act together to tell the TMS6100 which command to execute and (in the case of M0) act as the SPI asynchronous clock for data transfer. Due to this dual use of M0, it is connected both to the SCK (SPI clock in) of the microcontroller as well as PB1 (external interrupt 1). The hardware design uses a combination of the ATmega’s SPI peripheral (for the high-speed data transfer) and the INT1 (for M0) and INT2 (form M1) external interrupt pins (for detecting and reacting to incoming command pulses). The TMS6100 also has a clock input (CLK) which receives a clock signal from the TMS5220 to ensure the logic in the PHROM was synchronized with the processor. In this application the CLK signal is not required (as the ATmega can asynchronously react to the SPI CLK alone), however it is connected in the hardware for future use/expansion. To allow the ATmega to be programmed (using in-circuit programming over SPI), the rest of the SPI pins and the !Reset pin are also exposed on the ‘Not Connected’ pins of the TMS6100. The original TMS6100 was powered from a dual-supply -5V – + 5V power supply; obviously this is not suitable for use with a modern processor such as the ATmega32U2. In order to power the microcontroller the design draws positive voltage from the TM6100’s Vss pin and relies on the presence of a ground through the !CS pin (which is connected to 0V ground in the BBC Micro). You will also need to connect pins 13 and 14 to a 5V supply in order to power the AVR during programming. The PCB is designed to be made double-sided using a PCB fabrication service). 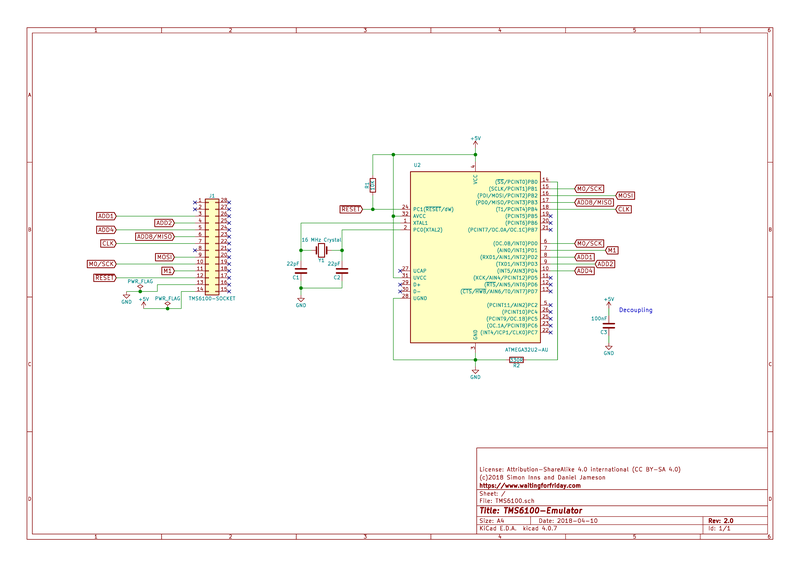 Full KiCAD schematics and PCB design are provided at the end of this article. Note that the Indirect Address command is not used by the TMS5220 and is therefore not implemented in the emulation firmware. The read data command has two primary forms a ‘real’ read (where the TMS6100 initiates data transfer to the TMS5220) and a ‘dummy’ read command. In order to provide a ‘real’ read the TMS6100 must have a valid address from the TMS5220. This address is sent as a 20-bit value using 5 nibbles of data sent from the processor. If the processor sends a read data command before transferring 5 nibbles of data, the TMS6100 resets into a known state (clearing any partial address nibble writes). Once the TMS6100 is in a known state the microcomputer waits for a speech command to be issued either by the user or by a running program. 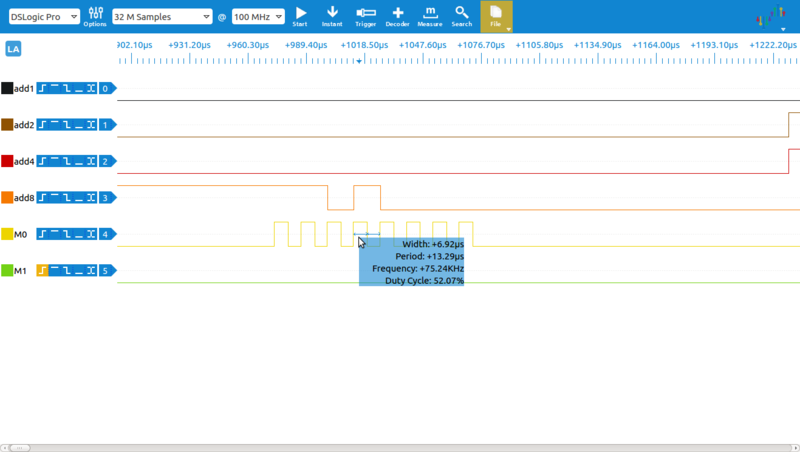 Once a valid address is loaded, data transfer is started by a single pulse of M0 (as can be seen in the previous two traces). This signals the TMS6100 to go into transfer mode. In the emulation this is used to turn on the SPI peripheral and hand control of ADD8 and M0 over to SPI. If the emulator detects a pulse on M1 control is handed back and the SPI is turned off ready for load address and dummy read commands again. The trace above also shows the approximate transfer rate of the SPI clock which is around 75KHz. For complete details of the firmware please see the numerous comments in the source code that attempt to explain all of the emulation functions. The function of the TMS6100 is common across all types of microcomputers that use the TMS5220 chipset and the PHROM data can be easily modified to represent data other than the Acorn PHROM. 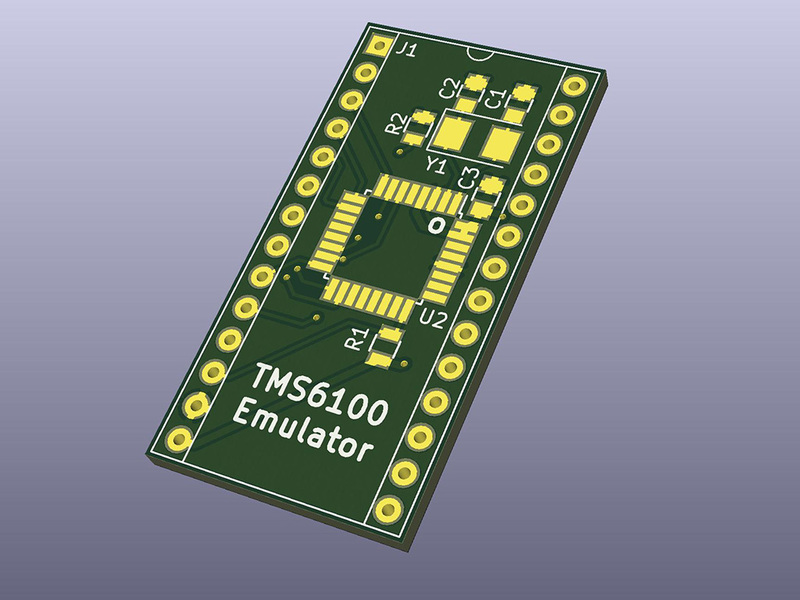 If you would like to use the emulator in machines other than the BBC Micro, care should be taken to ensure that the CS pin of the TMS6100 is tied directly to ground as the emulator relies on this for 5V power (the original chip used 5V and -5V). Only the features required by the Acorn implementation are included in the firmware; the comments in the firmware source-code state both the supported and unsupported features, so please examine the code for detailed explanation of the implementation. By default the firmware will compile to include the Acorn Speech System PHROM data however, if you define the pre-processor symbol PHROM_US, the firmware will compile using the TI American PHROM data (see the source code for details). Building this emulator was an interesting exercise in reverse-engineering (especially since I don’t have an original TMS6100 PHROM) and allows BBC Micro enthusiasts to provide a low-cost upgrade to their computers. The design is deliberately simplistic in that I tried to keep the component cost and PCB complexity to a minimum to make it as easy and cheap as possible to build. Since this is an open source project you are, of course, welcome to make your own, or even make them for others. I am interested in developing this as a commercially viable product, ie getting the pcb professionally fabricated with the components assembled as a complete package. I understand the working of the circuit but am unsure on the ATMEGA side. I am assuming that the chip needs flashing/programming with the correct PHROM to write the neccessary data to the ATMEGA, I am more used to programming 16K eeproms. I would like to ask your permission in the first instance if you would be happy with me getting this made? And also point me in the right direction for the programming side, I have got the atmel studio package but am unsure as to what else I would need to program the chip (I have a TL866) Any help would be gratefully appreciated, it is a great project and as there is very little available (proper TMS6100) virtually impossible. I think it is a viable way to go. Since the project is open-source, open-hardware you are quite welcome to make it and sell it. I’d appreciate it if you would attribute the project by linking to this page. 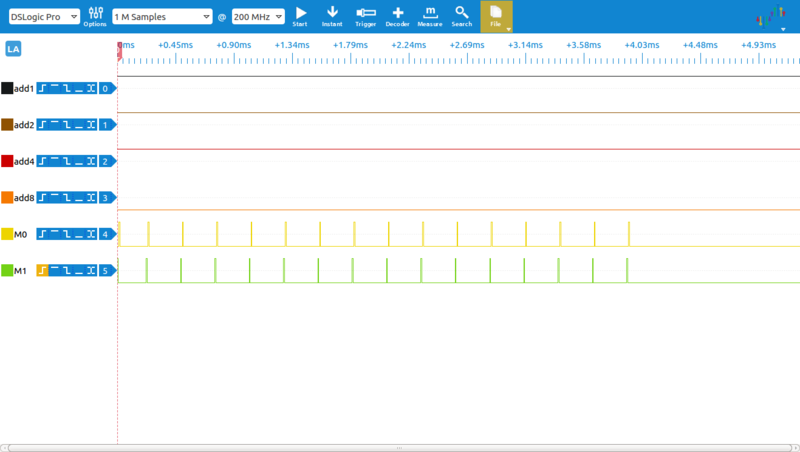 To program the AVR you need an Atmel ISP programmer (the same type as used to program the Arduino style boards). The programming pins are exposed by the board design (MOSI, MISO, SCLK and RESET); programming is performed by putting the finished board into a breadboard and connecting the programmer to the correct pins. You will also need to power the board during programming (i.e. connect the 5V and ground pins). Just drop me a note if anything is unclear. Thanks for the reply, I don’t have a website but I will add a link to this project via the 8bs site and any other forums that I am currently a member of, the more people that know about this the better! I take it that something like the AVRISP MkII would be suitable for the programming as it has it’s own 5v supply powered from USB so it would be only a matter of connecting to the pinouts and then programming via atmel studio? I will keep you updated of how I am getting on, once I am in possession of the PCB’s then I may need a bit of help with the programming if that is OK by you.